The Department of Justice has been cracking down on informants and has recently overturned a first amendment ruling that protected James Risen from disclosing his sources in this book, State of War. Despite these recent developments, Mr. Risen has vowed to go to jail to protect his sources, and last Saturday he said in a statement, “I remain as resolved as ever to continue fighting”. These facts had compelled me to pick up the book and read what all the controversy is about. 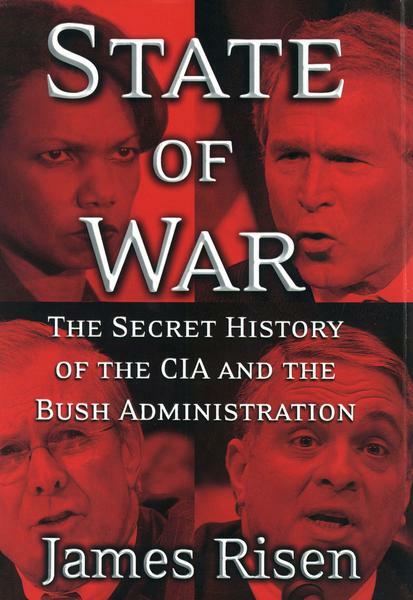 This book was an interesting peak behind the war on terror’s curtain. It explained how the CIA went from being the spy’s of the cold war to becoming the modern day Inquisition used by the Pentagon. Seriously, the people who made a career out of cloak and dagger operations were reassigned the duty of establishing secret prisons for “interrogation”. It also reveals why it was so easy for the NSA to turn their listening devices such as ECHELON on its own people. The last third of the book moves away from the information gathering, and it instead focuses on how Rumsfield and Wolfowitz push for the Iraq war was a complete political failure. Not only did their war sever many diplomatic channels, but also it allowed Al Queda to slip through US hands, and the Taliban to become the producer of 80% of the world’s heroin. Now, the reason why this book made its way back into the headlines is because it disclosed information on how the United States botched a covert operation and handed blue prints for a nuclear bomb to Iranian scientists. At times, this book seems bias against the Bush administration but the information is all there to back up his position. Because many of the informants are left anonymous, there was a need to make sure that the eye opening claims were backed up by several different sources. Over all, this was a quick and informative tale of the Department of Defense’s hubris during the Bush years. I didn’t feel like it was anti American propaganda or belonged in the tin foil hat wearing section, but I can easily see why it is controversial and why many members of the Bush administration have been removed from the spotlight.